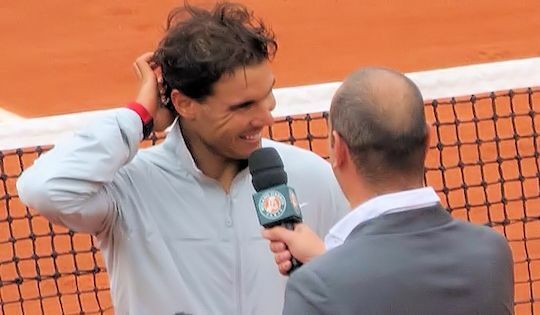 Week two started with Rafa's fourth round match against Dusan Lajovic who'd managed to come through the part of the draw that was left without seeds when both Nicolas Almagro and Tommy Haas retired in the first round. Quite frankly, I thought that the gulf in class between the two players was almost embarrassing. 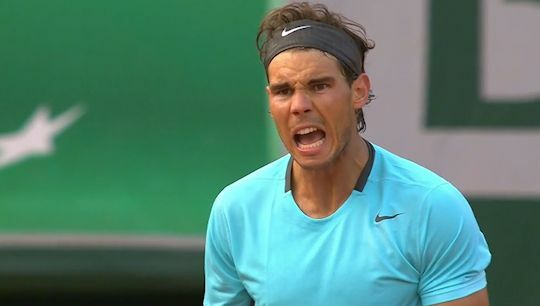 Rafa had very little trouble dispatching him, 6-1, 6-2, 6-1. We had multiple worries for the quarter final. Not only was Rafa playing David Ferrer who'd beaten him last month in Monte Carlo, but the weather forecast implied that they'd be hard pushed to get the match played. Luckily, the skies cleared for long enough to get the match underway. Unluckily, David Ferrer started as he'd left off in Monte Carlo and took the first set. 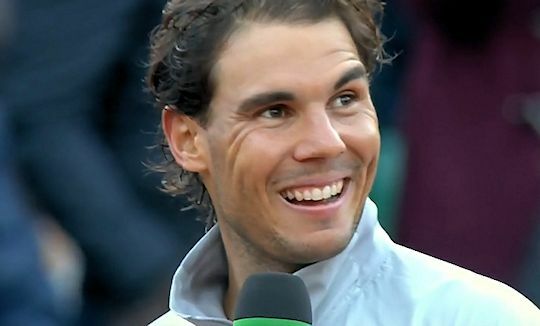 Rafa held his nerve, though, and was rather pleased when he evened things up by taking the second set. After that, Ferrer just faded away and Rafa delivered a bagel and breadstick to take the match, 4-6, 6-4, 6-0, 6-1. Readers of the British press could be forgiven for thinking Rafa would have a very tough time beating his opponent in the semi final - Andy Murray. They hype was probably due to Murray taking that set off Rafa in Rome. But that was a cold and windy evening. This was the sunniest day in Roland Garros this year. 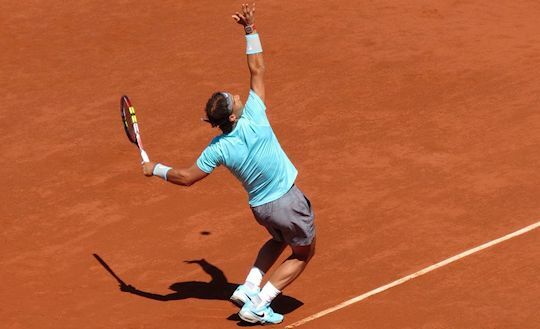 In the end, Rafa dispensed what can arguably be described as a drubbing, 6-3, 6-2, 6-1. 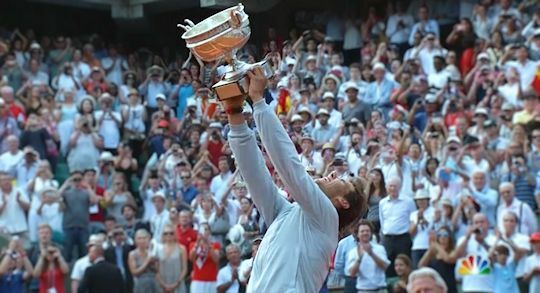 Prior to the start of the tournament, opinions were divided as to whether Novak Djokovic or Rafa was the favourite to win the tournament. Most went with Djokovic but after Rafa's comprehensive defeat of Murray, some were beginning to sway. Djokovic had come through his half of the draw having dropped 2 sets and spent two minutes under 13 hours on court. Rafa had dropped just one set and spent more than an hour less on court. Many were calling it the "dream" final that everyone wanted. I beg to differ. Fans of Roger Federer, Andy Murray and many other players will have wanted something different. 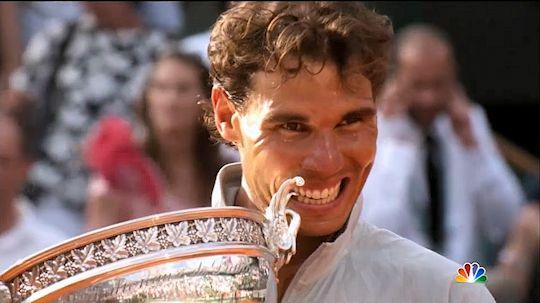 If I'd had my wish, Rafa would have been playing a first time finalist. Djokovic went off to a flying start to take the first set but Rafa fought like a tiger to take the next three and win, 3-6, 7-5, 6-2, 6-4. So that's an astonishing 9 titles at Roland Garros. No man has ever won a slam that many times. He's now equaled Pete Sampras's 14 slam titles so is second on the all-time list. He was won at least one slam for the last 10 years. No man has ever done that.